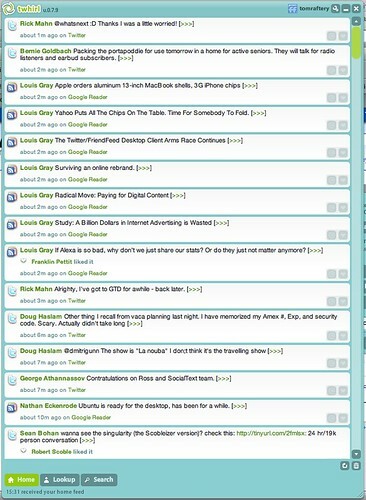 Friendfeed is a very cool site which aggregates all your rss feeds onto one page. This is cool because I contribute to 6 blogs and numerous other sites (Ma.gnolia, Flickr, YouTube, Twitter, etc.) often automatically without ever visiting the sites in question! Now I have one place to go to see everything I have published. Better yet, others can see this page and better again, I can see all my friends updates to their sites on a single page (and leave comments on them!). This is all very useful but suffers from the same problem that the Twitter page suffers from. You need to constantly refresh to see the latest updates. To get over this there are several Twitter client applications for the desktop (and for mobiles, Blackberry’s, iPhones/iPods, etc.). The one I use is called Twhirl and it is very cool because as well as auto-refreshing, it gives audio and visual notification of replies and direct messages. So earlier today when I read Mike Arrington’s post about how Friendfeed is now available through Twhirl I immediately downloaded the latest version of Twhirl (0.7.9) and set it up. Even better, through the Twhirl Friendfeed interface you can also comment on and favourite others posts. I love it. Now I’ll have to watch who I add to my Friendfeed friends list very carefully as this could overwhelm me very quickly! Mallow Camera Club are holding an exhibition of photographs in Mallow Town Library for charity for the next three weeks and fellow blogger, photo blogger and WordPress lead developer, Donncha O’Caoimh will have one of his photos in the exhibition for sale – well done Donncha. Head along if you get a chance, it is for a good cause. I wrote a post the other day talking about a blogger who stopped all Firefox users from visiting his site because they may have the Adblock plugin installed! Adblock is a plug-in for Firefox which allows you to view sites on the Internet but avoid seeing the ads they display. Iâ€™m very much against Adblock myself. I installed it once and it provided one of the worst web expierences ever. Adblock was presenting white areas where there would be ads, a lot of webpages looked very naked as Adblocked skwed the natural appearance of the site. I would love to see Adblock and other ad blocking extensions illegalised but itâ€™s never going to happen. My attitude is quite different. I read hundreds of websites per day. The majority of these sites I read through my RSS reader so even if they are displaying ads, I don’t see them. To the commenters, if you truly believe that people should only view your content if they also read your ads, you need to either stop publishing RSS feeds or start publishing ads in your feed. As to the point that his business revenue may depend on Ads – if so, then stopping all viewers who use Firefox is only going to hurt his revenue, not help it. Firefox users are, in general, more tech literate and therefore are more likely to link to your site. Banning them from your site will only reduce inward linkage, drop you in search engine results and decimate your ad revenue. Ads (especially Flash based ads or graphical ones) slow down the loading of sites and therefore waste my time without adding any benefit to me (I haven’t blocked Google Ads as they are non-intrusive, text based ads). I have never clicked on an ad on a website and I have seen plenty of them (non-blocked Google Ads and when I use browsers other than Firefox). According to Google Analytics, Search Engines account for 73% of traffic to this site. The majority of people who do click on ads are, I suspect, one off visitors to a site who land there from a search. This demographic doesn’t use Firefox, doesn’t use RSS and has never heard of Adblock. For people who use the web all day, every day Adblock is a boon. It vastly speeds up your browsing experience, eliminates distractions (think flashing blinking ads) and cleans up the content on the page. For ad publishers, Adblock makes you site far more palatable to the small demographic of users who know how to deploy it. This demographic wouldn’t click on the ads on your site in any case. And this user, is far more likely to promote your site for you, thereby driving traffic to it. 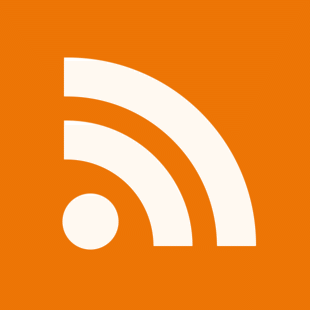 I have now completely moved over to using Google Reader as my primary RSS reader. And it appears I am in good company! I started using it regularly while on holidays on my phone and I grew to like it – particularly the ability to Star and Share posts. Now I’m using it full-time, not only for these features, but also because I can use it on my Vaio, my MacBook Pro and my mobile phone (I still read and Share many items on the phone at home). There is really cool trending software in Google Reader as well to help you figure out which blogs update regularly (with a one-click option to unsubscribe from ones which don’t), which blogs you Star and/or Share and it charts your reading activity by day (and by time of day). The only thing which annoys me about it is that the list of unread items my phone displays differs from the list my computers display. I don’t know why this is, they are running from the same account, reading the same subscription list. Has anyone else noticed this? BlogTalk 2008 to be held in Cork? BlogTalk is a big international conference around the Social Media space. The last BlogTalk conference was in Vienna and featured speakers such as Danah Boyd, Suw Charman, and Matt Mullenweg. Thomas Burg, John Breslin and I are going to see if we can organise the next BlogTalk conference for Early March 2008 in Cork. TechDirt has an article explaining why full feeds lead to more page views on your site than partial feeds. Full text feeds makes the reading process much easier. It means it’s that much more likely that someone reads the full piece and actually understands what’s being said — which makes it much, much, much more likely that they’ll then forward it on to someone else, or blog about it themselves, or post it to Digg or Reddit or Slashdot or Fark or any other such thing — and that generates more traffic and interest and page views from new readers, who we hope subscribe to the RSS feed and become regular readers as well. The whole idea is that by making it easier and easier for anyone to read and fully grasp our content, the more likely they are to spread it via word of mouth, and that tends to lead to much greater adoption than by limiting what we give to our readers and begging them to come to our site if they want to read more than a sentence or two. I have long had full feeds on this site and have written numerous times about the merit of full feeds. Further, I don’t subscribe to any sites which only publish partial feeds – it is a waste of my time having to click through to read the full article on the original site. You can be sure I am not the only one who thinks this way! on the launch of Blognation Ireland earlier today.